It has been the choice decoder for most Dstv multichoice subscribers,this article contains the features and specifications of DStv Explora. With DStv Explora you don't need to waste money and time to go to the movies,simply rent any of the 20 blockbuster movies from the comfort of your sitting room,watch and keep the movies for 48 hours. New DStv BoxOffice users are usually given their first rented movies free of charge. Most times we are busy with work and end up missing our favorite shows and sports highlights. You can also download hundreds of extra catch up titles for your series,this however is possible when you connect your DStv explora to the internet. Simply record all your favorite shows with Remote Recording,you do no longer have any reason to miss your favorite show. To record your favorite series and shows access DStv's online Tv Guide or download DStv Now to your device,then login and schedule a recording on your already connected DStv Explora. The Playlist is the DStv explora's way of organizing all your recordings of up to 220 hours. The DStv Explora arranges your recording into different categories making it easy to locate the particular recording you are looking for. Enjoy viewing your TV in crystal clear high definition picture. 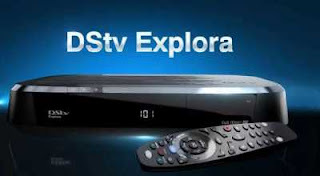 With DStv's explora decoder HD viewing,you will enjoy every moment of television viewing. With DStv content discovery you can easily find what your looking for easily. The DStv explora comes with a movie, sport, series, theme, keyword and advanced search options. You can easily discover and tune into your favorite show within seconds by simply pressing the search button. DStv explora decoder comes with a very stylish new remote control. The new remote controls buttons are well spaced out,with new features and functions,unlike the previous remote control where all the buttons are jam-packed and struggling for attention. ,record your favorite movies and shows and still have space for blockbusters.